Airbus parent firm EADS has won a 27-year, £13bn ($26bn; 17bn euros) contract to provide new air refuelling tankers to the Royal Air Force (RAF). The deal comes less than a month after EADS won a similar air refuelling contract from the US Air Force. 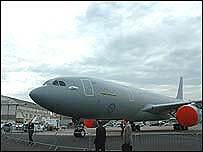 Due to enter service from 2011, the RAF will lease 14 Airbus A330-200 aircraft from EADS-led consortium AirTanker. They will replace the RAF's existing fleet of TriStar and VC-10 refuelling planes. The wings for Airbus aircraft are designed and made in the UK at Broughton in north Wales, and Filton near Bristol. "The Ministry of Defence's requirements are known to be highly exacting, and we are grateful that its trust has been placed in EADS and our consortium partners, Cobham, Rolls-Royce, Thales and VT Group," said EADS chief executive Louis Gallois. EADS' similar win in the US was secured in partnership with American firm Northrop Grumman, and is worth £17bn. That success angered EADS' big US rival Boeing, which lodged an official protest. "The deal is good news for British jobs," said Junior Defence Minister Baroness Ann Taylor. "Up to 600 are expected to be created by AirTanker, and the deal will safeguard up to 3,000 jobs directly at British sites, with thousands more sustained indirectly." EADS is a pan-European company based in Germany, France and Spain.